I decided it would be cool to get back into doing astrological forecast and tarot readings for the moon cycles. Back in 2013, I frequently posted astrology reports based on my intuition and understanding of the cycles and what the Collective Consciousness was going through. A lot of people responded positively to those types of post, so I figured with the birth of my new blog and all, why not reignite that flame? Anyway, on to the reading! 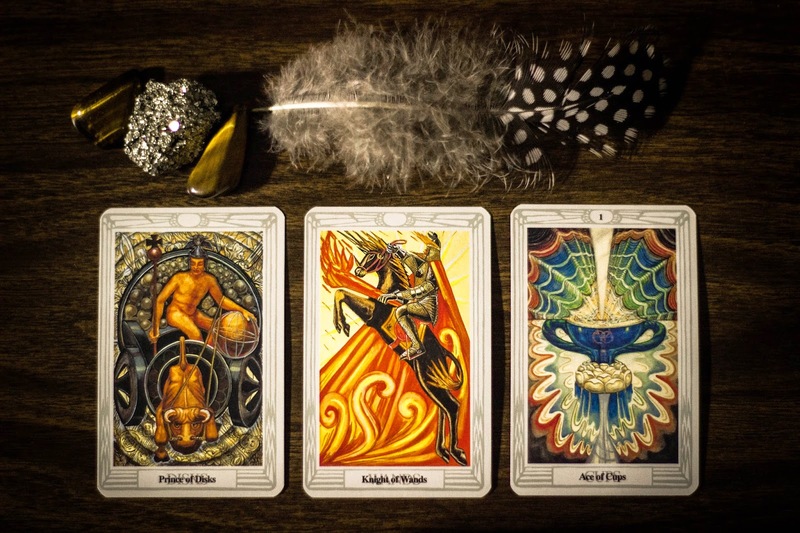 I'm using the Aleister Crowley Thoth Tarot deck. I love this deck because of the artwork. The symbolism is truly astonishing. The first card I pulled was the Prince of Disks, and wow, what a powerful card this is! Embedded with a lot of Taurus symbolism, this card is urging us to stay consistent and persistent when it comes to achieving our goals. Following Aries in the zodiac, Taurus can be thought of as a grounded energy which can help bring the fiery Aries ideas to life. 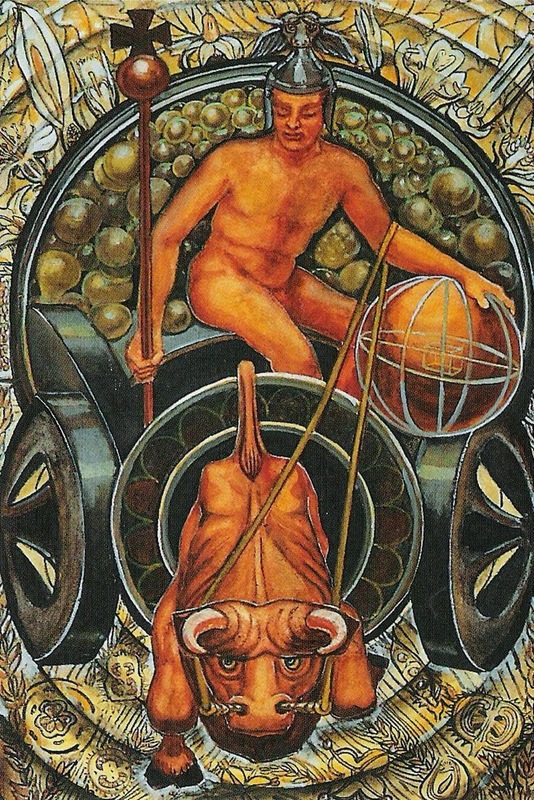 The man on the card is holding an orb that resembles a globe, symbolizing that he is literally "in touch" with his potential. And not just any potential! He is holding the globe with his left hand which represents working with his right brain- the spiritual and feminine hemisphere. Overall, this card represents manifestation-- planting our seeds, so to speak. Bringing our out-of-this-world ideas and dreams into this world.. Staying grounded while still holding our vision of the end result in our hearts. This one falls perfectly in line with the Prince of Disks. 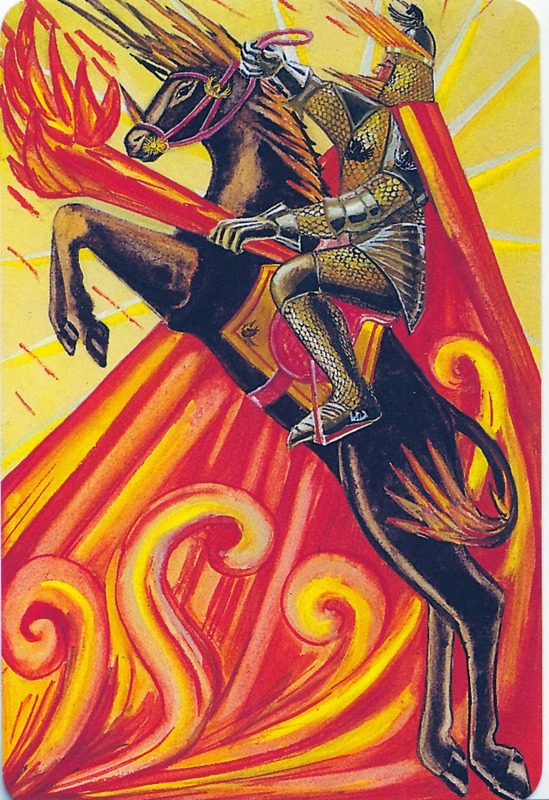 This card is the Knight of Wands. Notice how he is charging ahead, with his vision locked on the path laid before him. The red and yellow flames invoke a Mars energy, activating the root chakra and solar plexus. Mars is all about moving through life and taking action. I would say this card is telling us to charge forward and take steps towards achieving our goals. This last card is my favorite! 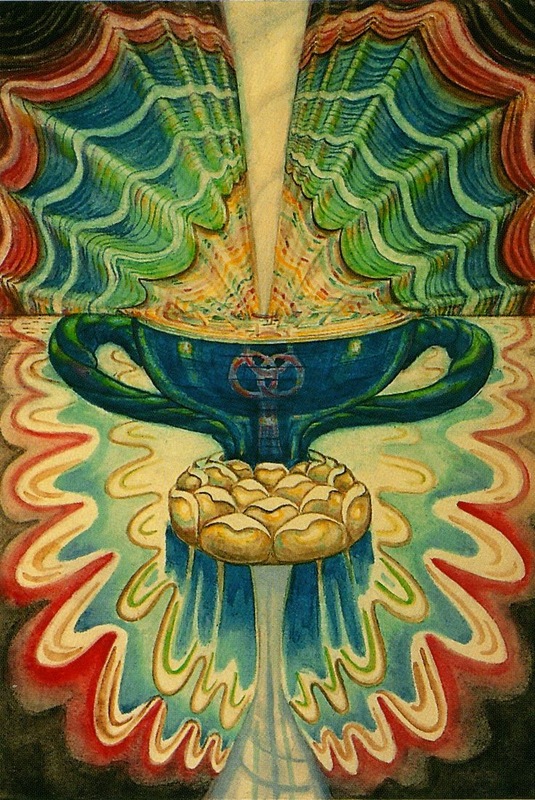 The Ace of Cups! Look how abundant the cup is. It appears to be almost overflowing. The beam of light symbolizes a connection with a higher power, like being downloaded with a wave of inspiration. This card was intended to be the end result if things fall into place according to the first two cards. It looks pretty great to me! This card is the epitome of manifesting abundance, and in my opinion, perfectly aligns with the message of this trio. Overall, this reading emphasizes having a grounded vision, taking action towards your dream, and ultimately reaping the rewards. Beneficial gemstones for this time include Tiger's Eye and Pyrite (seen in the first photo of this post). Tiger's Eye is a wonderful stone for manifesting and staying grounded, while Pyrite encourages positive thoughts. I randomly chose these rocks, and only after understanding the reading did I realize how perfectly these gemstones compliment the message of the cards. I hope you resonate with this Tarot reading! Have a wonderful New Moon, and don't forget to check back Wednesday for a new post! great reading, Rozelyn :) thank you!